The Buffalo Grass Blog documented 8 weeks of growing UC Verde Buffalo Grass in their yard. I recently used this grass at the Hyundai Headquarters in Fountain Valley, California as a lawn substitute. I think it’s a great options for the front yard. This grass uses about 75% less water than the traditional grass and was developed by researchers at UC Davis and UC Riverside specifically for the California climate. Buffalo Grass is typically sold small plugs and not by seed. Plant the plugs at 8″ to 10″ on center and they will spread by stolons. You should have a full coverage within a 4-6 months if you plant the plugs in the spring. Dog owners will be pleased to know this variety of grass not only holds up to foot traffic, but is also non-toxic for grass chewing hounds, while also being beneficial for improving allergies because this grass does not produce seeds. UC Verde Buffalo Grass is even available online for direct delivery to make establishing a new lawn easier. Landscape designer Julie Orr used Agrostis Palens to beautiful effect, noting Native Bentgrass does well in full sun and does a good job of looking like a traditional lawn. One of my favorite meadow grasses. Although this grass can be occasionally mowed, be aware this grass wants to be a meadow. If you want a more immediate cover use this species. It can be seeded any time (although prefers the fall season), germinating within a few weeks. It normally goes dormant during the summer, but can be kept somewhat green with occasional water during the hot months. This is a great option if you live near the coast. 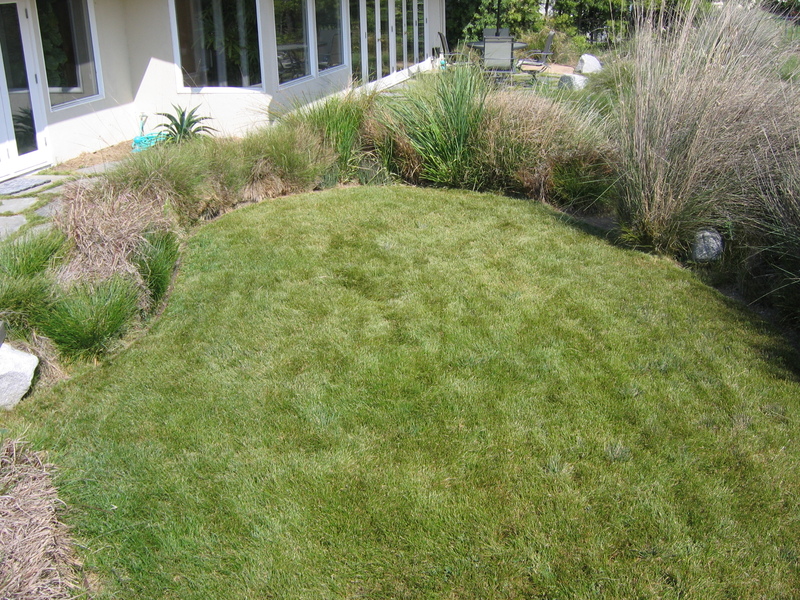 This grass uses about 25% less water, but once established it will appear similar to your old lawn. I’ve seen a few installations in the Santa Barbara area and California Field Sedge will tolerate some foot traffic as well as occasional mowing. Although it can be seeded, it is best to plant this grass with containers. This grass will spread by rhizomes.